MUN Qatar 2017: First Day in Doha! We began our first full day in Doha with a visit to the Fanar Islamic Cultural Center where we were given a brief introduction to Qatari culture and history. 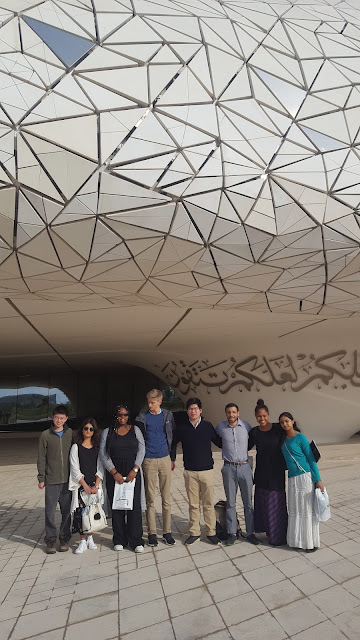 Our guide, Adam, introduced us to Qatari living room (majlis) culture and provided an overview of Islam, emphasizing its similarities to the other Abrahamic religions, Judaism and Christianity. We then took a short drive down to Education City, where many of the American-affiliated universities are located along with a few Qatari ones. 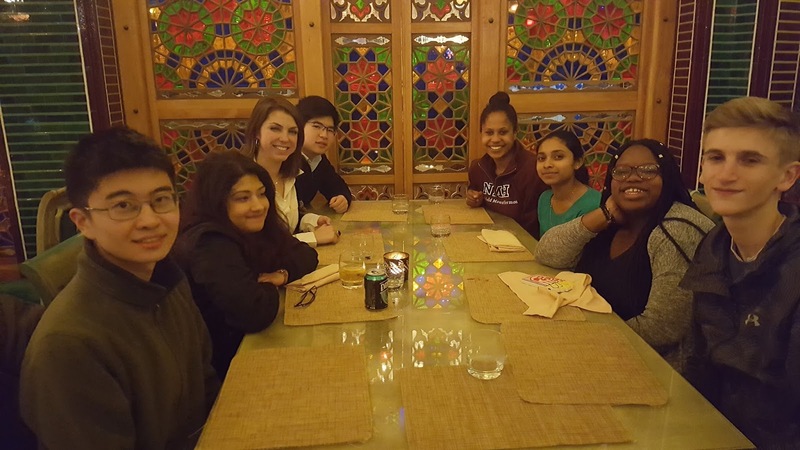 We were fortunate enough to have lunch with Najib Ahmed, an Abaarso school alum studying at Georgetown Qatar, and to hear his stories and experiences from his time in Doha. There were a number of differences, Najib told us, from the American college experience, most notably the gender-segregated dorms. The group continued with the day's itinerary by heading to the office of Uday Rosario, a lawyer and labor rights activist in Qatar working at Georgetown. This was the highlight of our day as we fought past jet lag to glean insight into the socioeconomic and political climate of Qatar. Uday explained to us that at the roots of all the problems is Qatar's struggle with its own national identity. Even though only 200,000 out of 2.4 million people hold Qatari passports, studies indicate that up to 80% of Qatari citizens said the country would be better off without migrant workers. This is a country that is having a difficult time answering what it means to be Qatari. This leads to the myriad of problems that we see and hear about in the news today about Qatar. The exploitation of workers is a reflection of the unjust status quo that nobody is willing to change; the foreign businesses that are making a quick buck, the expats that live in luxury and even the Qatari government, and even a rather progressive monarchy that can't do anything due to the threat of losing its power. Uday concluded our insightful conversation by imploring us to notice these issues in other places around the world; this is by no means specific to Qatar. He stressed that the exploitation of workers traces back to Chinese immigrants building railroads in America and to this day is, effectively, a modern form of slavery. After our conversation with Uday, we headed over to the Hamad Bin Khalifa University where a friend of Grant's, Sulaiman Bah is studying for his Master's in Public Policy in Islam. In particular, Sulaiman is looking into environmental advocacy work based on Islamic principles. Sulaiman gave us a brief tour of the futuristic, spaceship-shaped building and introduced us to some of his professors. We concluded the day with dinner in the Souq Waqif with Delia Flanagan, NMH class of '09. Delia hosted us at one of her favorite restaurants in Souq Waqif. We dined on Persian food, and while we were exhausted, Delia shared her insights of working in Doha, and we told stories of NMH today. Delia was so warm and welcoming, and it was a wonderful way to conclude our first full day in Qatar. Dinner with Delia Flanagan, NMH class of '09!